Online lessons can be just as effective as in-person lessons for teaching you the basics of your instrument, developing technique, and achieving your musical goals! Learn about how to make sure that your computer’s hardware and internet connection will give you the best video chat possible for your lessons. A fast internet connection will help you see and hear me during your online music lessons. We’ll probably be using either Skype or Google Hangouts, so let’s take a look at the minimum requirements for each video chatting service. Skype recommends a minimum of 128 kbps/128 kbps upload/download speed for video and audio chatting. However, they also note that you’ll get the best performance with 300 kbps/300 kbps. On the other hand, Google Hangouts’ minimum is 256 kbps/512 kbps upload/download speed and, for best performance, 1 mbps/1 mbps. Keep in mind that 1 mb (megabyte) equals 1024 kb (kilobytes). This means that for the best video chat performance on Google Hangouts, your internet connection needs to be faster than it would need to be for Skype. If you’re having trouble with your performance, try closing other internet-connected programs and any file transfers first. 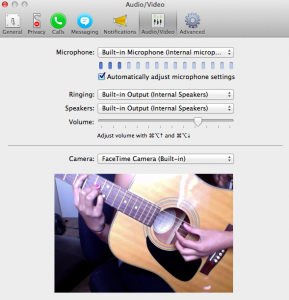 Your webcam helps me see you, how you’re holding your instrument, and — most importantly! — how you play. Skype recommends using a webcam that is capable of a picture with an image resolution of at least 320×240 pixels and 15 frames per second. You can check the quality of your webcam on Windows and Mac. Audio, of course, is also important! Without a good mic, I won’t be able to hear you speak or play your instrument. Skype has troubleshooting guides for Windows and Mac; try going through the steps first if other people have a hard time hearing you. All Apple computers made after 2005 come with a built-in camera that can provide a picture that is 640×480 or greater. Some Windows computers will come with a built-in camera; if you need to purchase an external camera, check its description to make sure that it complies with the minimum recommendations listed above. Lifehacker has five recommendations at varying prices that you can browse. In addition to a Windows, Mac, or Linux computer, you can also use Skype on an iPhone, Android phone or tablet, a Windows Phone 8, or a Blackberry 10 phone. Google Hangouts is available on Windows, Mac, and Linux computers as well as Android and iOS devices. While some students prefer to review their music from their computer or a tablet device, others like to print out their materials. If you don’t already have a printer, PC Mag has guides for both Windows and Mac. We’ll tune your guitar or bass at the beginning of your lesson, but having your own tuner can be convenient, too. If you do end up purchasing a tuner of your own, I’ll teach you how to use it so you’ll always sound great. 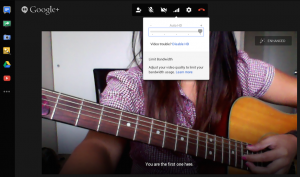 A good internet connection, webcam, and mic can make a big difference in the quality of your online music lessons! Do you have any questions about your current set up or how to begin taking online lessons with me? Let me know! Leave a comment here or contact me through my website.